“Saving Face” – A Chinese love story! Meet Wil, a very promising surgeon doing her residency in New York, who is consequently at the beck and call of her pager. She’s stressed to the point of being terribly uptight, stiff, and left with little spare time to herself. This is Wil. She’s 29. Meet Vivian, a very promising ballerina waiting to find out if she’s been accepted to the Paris Opera Ballet Corps, but enjoying (and preferring) her sabbatical as a modern dancer. She’s a complex girl who knows what she wants, even if it’s often difficult for her to acquire. This is Vivian. She’s 28. Wil lives by herself in New York, in a small apartment, running like crazy across town in order to answer her constantly wailing pager. For the most part, she seems to live a life of solitude, interacting only with her neighbor and her co-workers. However, every Friday her mom, Hwei Lan, nags her into going back home to Flushing to attend the weekly Chinese dance parties: Wil might be a lesbian, but that’s not stopping Hwei Lan from trying to find her a husband. The other person she seems to regularly interact with is Little Yu, who works for the subway. He’s the son of Old Yu, who’s a fortune teller and sells herbs. So, every week on the way back from Flushing, Little Yu hands Wil a packet of Old Yu’s herbs that are meant to help improve her chi so that she can settle down and get married. Apparently they are stinky, stinky herbs. Wil’s mom is sleeping on her front stoop with sunglasses and a gigantic pack of toilet paper. Now, Wil’s mom is a widow, and lives with her mother and father in Flushing. Although she works at a beauty salon, and although she’s 48, she’s seemingly dependent on her parents, and mostly controlled by her father. To see her outside of Flushing, just hanging out on the stoop… Well, it gives Wil a cause for concern. …Particularly since she’s brought a ton of things with her and proceeds to plant herself on Wil’s bed, cranks up some Chinese music, and absolutely refuses to explain why she’s there. But she’s banished until she tells everyone who the father is. …And she flatly refuses to do so. So with nowhere else to go, Hwei Lan moves herself into Wil’s apartment, and immediately takes over. Hwei Lan’s starting to learn what independence is like, but it comes at the price of her daughter’s own freedom. She’s somewhat trapped in the apartment because she’s been banished from Flushing, and that means she’s always around when Wil comes home. And since Wil’s uptight and private, it means that her blossoming relationship with Vivian is kept very, very, very secret. Vivian’s way more comfortable with who she is than Wil ever thinks of being. Anyway, Vivian’s hinting that she wants more than a secret romance, which puts Wil on edge. …And she’s already on edge anyway, because she’s got a pregnant mother at home who doesn’t get out enough, and refuses to confess who the baby daddy is. So under the pressure of needing to get her mom out of her hair, she decides to set Hwei Lan up on a series of dates. Hwei Lan is less than thrilled about the prospect of dating – she’s resigned herself to being a single mother, banished from Flushing, living out of her daughter’s apartment. Not so well, it seems. Wil’s grandfather is also concerned about the situation. Yes, he’s banished his daughter from home, but that doesn’t mean it has to be permanent: all she has to do is get married before the baby comes, and all will be forgiven. So he takes matters into his own hands. Vivian drops a hint that she wants to meet Wil’s mom. Wil scoffs, much to Vivian’s annoyance. But Vivian isn’t one to take “no” for an answer, and she manages to push Wil into inviting her over for dinner. …So she asks if Vivian has a boyfriend, and Wil begins to panic. Vivian catches on and plays it cool, dancing around the topic instead of coming right out and saying the obvious. Hwei Lan’s romantic life has also gotten complicated. She’s agreed to date Cho – the man her father had selected for her – but while he’s nice, there’s just no spark for her. …However, there’s definitely a spark for Cho. This makes things difficult for Hwei Lan, because while she doesn’t fancy Cho, he is the obvious ticket back to her old life. And just when it looks like her mom might be giving in to marrying Cho, thus freeing Wil’s private life back up, Vivian finds out she’s been accepted to the Paris Opera Ballet Corps. Vivian’s obviously waiting for Wil to protest the move and prove her love, but Wil’s got a knack for destroying a moment. To make matters even more complex, Wil’s grandmother suddenly gets sick and lands herself in the hospital. Did I mention that the doctor who’s talking in this scene is both Wil’s boss and Vivian’s father? Vivian rushes to the hospital to comfort Wil, only to realize that Wil wouldn’t be able to handle such a public display. And that’s when Wil’s boss realizes that she’s dating his daughter. The pressure of having her grandmother in the hospital, watching her mother seemingly forcing herself to date Cho, and the extra weight of having her boss “encouraging” her to push Vivian into accepting the contract with the Paris Ballet (Vivian’s been delaying the decision because she wants to stay in New York and do modern dance – and she wants to stay in New York and do Wil) finally shoves Wil into a stupor, and she just shuts down for a few days. Instead of doing what she wants to do, she does what every authority figure in her life tells her to do: she breaks up with Vivian. Well… That didn’t go well at all. Hwei Lan suddenly realizes the place she’s found herself in: her mother is dead, her father is alone, she can’t live with her daughter, she won’t say who her baby daddy is, and the only way to make things better is to give in and marry Cho. Hwei Lan makes a snap decision to marry Cho after all, and the ceremony is scheduled almost immediately. Wil isn’t invited because her mother isn’t speaking to her. And, to top it off, the day of the wedding is also the day of Vivian’s departure to Paris. Wil finds herself completely alone on the eve of two major events. And Wil suddenly realizes who the baby daddy is! And although Hwei Lan has prevented Wil from being with the one she loves, that doesn’t stop Wil from encouraging her mom to be with the baby daddy. This announcement causes quite the uproar! So what does Hwei Lan do? Does she confirm or deny Wil’s suspicions? Does she save face and marry Cho? Does she hook up with the baby daddy? Does she make peace with Wil? Does she go back to Flushing? …I won’t give away this plot point! You’ll have to find out on your own! Meanwhile, though, Wil’s been inspired to go after Vivian, and catches her just before she boards the plane to Paris. …and demands Wil proves her love right then and there. So! Does Wil win Vivian back? Do they live happily ever after in New York? Does Wil remain alone? Is she ever pressured into getting married to a proper Chinese boy to save face? Does Vivian get to pursue her dream of doing modern dance? 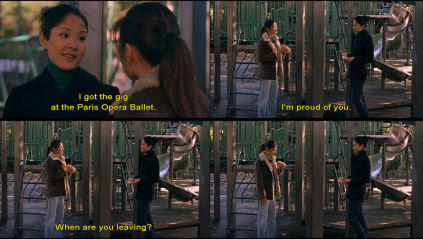 Or does she give in to her father’s dream of her being a ballerina in Paris? Does Wil ever relax? So who is he talking to, and who is he talking about??? You’ll just have to watch “Saving Face” in order to find out! This is beautifully written! Thanks for all the time and effort. I’ve watched this movie again recently and was still touched by it. I m sure that I will read this post again and again!